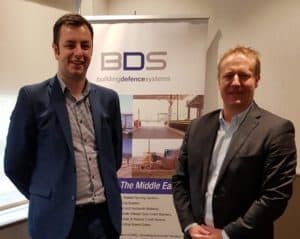 Building Defence Systems and Harper Chalice have formed a new partnership in the Middle East to promote and sell the Perimeter Security solutions manufactured by Harper Chalice. Harper Chalice are a manufacturer of specialist electronic perimeter security detection systems. All of their systems are manufactured in the UK and are independently tested and approved for use on the highest security level sites. With 20 years’ experience in the high security market, their systems have a proven performance and are a leading provider of perimeter detection systems. The range of Perimeter Intrusions Detection (PID) systems manufactured by Harper Chalice include Microphonic PIDS for the protection of Fences and Walls as well as Electric Pulsed Security fence for additional deterrent and detection. Building Defence Systems, based in Bahrain, will add the complete range of system manufactured by Harper Chalice to their product offering and will promote the solutions across the Middle East region. The partnership have been working very closely across the Middle East region on several very large and high profile opportunities. The potential of the partnership is huge given the growing demand for perimeter detection systems in the region. Visit www.bdswll.com for more information about Building Defence Systems’ full range and www.harperchalice.com to learn more about Perimeter Intruder Detection Systems.